Best graduation photo ever! 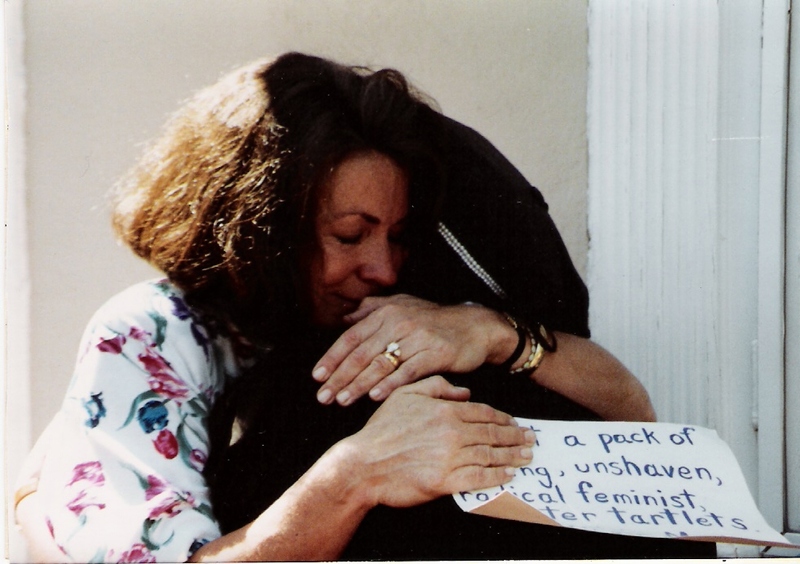 I had just graduated from Wellesley in 1990 and the rebel in me, reacting to the media frenzy that surrounded our graduation, wore a sign on my back proclaiming that I was among those the press had labeled “just a pack of whining, unshaven, radical feminist spinster tartlets.” This small group of women graduating from Wellesley in 1990 had started the “Mommy Wars” (according to the international press, anyway). Aside from the internal politics of how our commencement speaker was chosen, the issue being raised was not, as the media would have you believe, that we opposed Barbara Bush’s decision to drop out of college, marry and raise a family. The issue of concern was the question of how many women graduating from college (even Wellesley) in 1990 would have the economic stability to be able to choose to abandon their education, give up a career, stay home to raise a family without a job outside the home and still maintain that level of security. In any case, Barbara invited her friend, Raisa Gorbachev to speak as well, and while the president of the college invited Hilary Clinton to speak two years later, still (after playing on both sides of the political fence) she wasn’t chosen for the coveted position of Secretary of Education. Our graduation was a media circus but we had a glorious day nonetheless. And this is my graduation picture. This picture depicts a very special moment that day. One of my dearest friends, Maryann, had just given me a monogrammed pendant as a graduation gift. Engraved on the back were the words “You are enough.” along with the date. These words came from a poem entitled “You Are Enough! : A Woman Seminarian’s Story” by Nancy Ore that was published in Rosemary Radford Ruether’s book Womanguides. It is a poem about women being told throughout our lives that we are not enough, that whatever we do is not enough. From our parents to our spouses to our children, there is an underlying message that simply being who we are is not enough. And then there are the pastors who tell us that all of our work in the church is not enough unless we internalize all the guilt of humanity over the starving of children in the world. And the counselors who tell us that our only hope for sanity is to struggle with our demons, integrate our childhood traumas, stop crying, “clarify our poetic symbols” and not feel that we are not enough. While all those around us tell us we are not enough, we are also being told that we truly are not enough if we accept this. What hope is there? The poem ends with a resurrection image but for Maryann and for me and I suspect for countless other women who struggle with these messages everyday, it is this voice telling us that we are enough, no matter what, that helps us not give up. No matter if you are naked, if you are crying, if you are bleeding, if you are nameless, if you are starving, if you are sinful – YOU ARE ENOUGH! My friends, YOU ARE ENOUGH! Listen to the voice. Thank you for this powerful reminder. When I was earning my MTS, pastoring a congregation full-time, working as a volunteer firefighter, and a mother and a wife, I became very disappointed in myself when I was only getting B+s on my work. My thesis advisor is a religiuos sister. She gently sat me down and said “Repeat after me, It is good enough. I am good enough.” I earned my MTS. But I learned so much more. It is good enough. I am good enough. Thank you Stacey. Yes, you are enough! And you always will be. I especially liked the part where the poet says you are enough “naked, crying, bleeding, …” Even when we think we are most unlovable, we are still enough. Thanks for reading and thanks for your comment. Peace. Hi Pat! FYI we just reposted this to the class of 1990 website. Great post! Thanks Vanessa! Just joined the page – hadn’t known about it before.